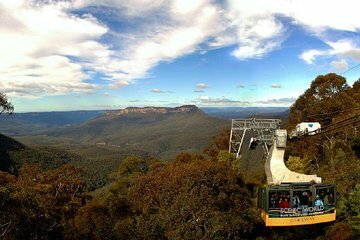 Entdecken Sie die natürliche Schönheit der Blue Mountains in Australien auf dieser ganztägigen Busreise ab Sydney. Bewundern Sie das Wahrzeichen Three Sisters und genießen Sie die unglaubliche Aussicht über das Jamison Valley, während Sie bei Scenic World mit der Eisenbahn und dem Skyway fahren. Das ist noch nicht alles: Besuchen Sie das lebhafte Bergdorf Leura und beobachten Sie Kängurus und Koalas im Featherdale Wildlife Park. Nice tour. Short time to see everything but it qas ok. The driver at first was a little moody but after a while he was ok.
Everything was great until we got to the boat for the cruise. The boat was seemingly over-full. All seats were taken. The only option was to stand outside. Luckily it was a nice day but if it had been cold or raining, it would have been a disaster. Very long day but worth it. Blue Mountains are beautiful. Loved seeing the koalas and kangaroos at the park. Book your rides in advance for the Scenic Park, cheaper than if you wait and buy there. Must take the steepest railway and the cable car! The cruise at the end of the day does not have seating for everyone so be prepared to stand in the wind and sun for at least 45 minutes. Also, was not aware we would have to find our own transportation back to our hotel. It was a great trip. A lot to do in one day. Worth the money. A must visit place when going to Sydney. The tour was very organized. Pick up on time, drop off on time, seating arrangements, tickets, time schedule for the day. Nothing can ask for. Excellent driver/tour guide. All praises. Once we got to the Wildlife park it was a little chaotic. We did not realize that we needed to pay extra money to be able to view the park properly. Our driver kind of sprung it on us asking for more money in cash only to see the park much more easily. I think aviator should spell out that it would be very difficult to access the park with out the upgraded. This was a great tour I would defiantly recommend it. We had a great time and our tour guide Tony was awesome. He told us all about scenic world. Featherdale wildlife park was the best. You could get your photo with the koalas and they had so many kangaroos. One had a little joey sticking his head out of mummy's pouch. We played with tho wombat scratching her tummy there was so much to see. I will defiantly book this tour again. Although we had a group of 19 and we walked about 3/4 of a mile to catch our bus and then the bus drove right up to out hotel and picked up 1 passenger. So I wish they could of organized that a bit better. One of the best tours we've ever taken. Informative and funny. Would highly recommend.